How do Residential Crime Prevention Audits work? 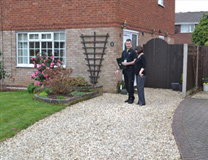 A Residential Crime Prevention Audit involves one or more site visits to your property. During the site visit, your analyst will take photos and/or video of the property (don’t worry… confidentiality is maintained with all media), and a comprehensive itemized assessment form will be completed. The analyst will evaluate all data gathered, and may include other available information from the community level (traffic statistics, crime statistics, planning and development, local bylaws, etc). These findings will be applied to the recommendations to be provided. What sort of things are assessed during a Residential Crime Prevention Audit?